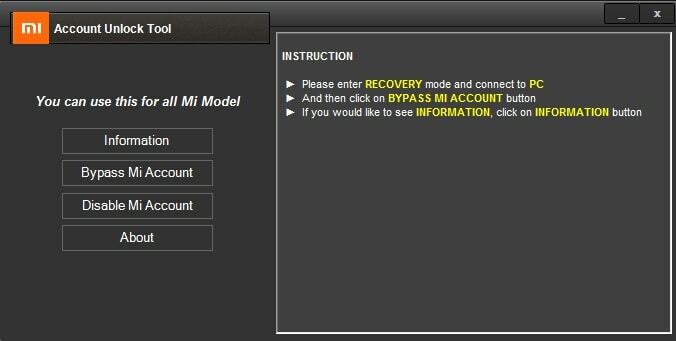 OK if you get a used Xiamoi smartphone and you have reset that smartphone now it,s asking about any mi account then what to do so don't need to worry we have a small but smart tool for bypassing or removing that type of locks which is called MI Account Removing tool for Windows OS based PC,s. That is a portable app just download that app and unzip that app on your PC any driver and if you have installed all the USB drivers of your Xiamoi smartphone on your PC then you can easily unlock that mi account at home. 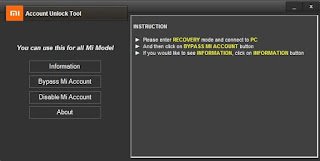 MI Account Removing tool is an easy tool to use just put your phone into recovery mode and when your PC install all the adb and USB drivers then just click on remove mi account and that will be removed and your phone will be restart in the normal mode and your mi account will be removed permanently.ones if you bypass mi account then create a new one mi account for using of or downloading apps or themes or backup or restore data on your mi account. But remember one point for removing FRP (Factory reset protection) or bypassing mi account form your xiamoi smartphone you must have to install all the drivers of your phone then you can do that. Mi-Account and the frp bypassing tool can run smoothly on Windows XP, Windows Vista, Windows 7, Windows 8, Windows 8.1 and Windows 10 (32 bit and 64 bit). Here we give you two download links for this amazing tool all the links we have tested and also tool is working so click on which mirror you want and enjoy this free app.